Currently Bruder have three toy backhoe diggers in their construction series, ranging from their very first model way back in 2003, up to present. 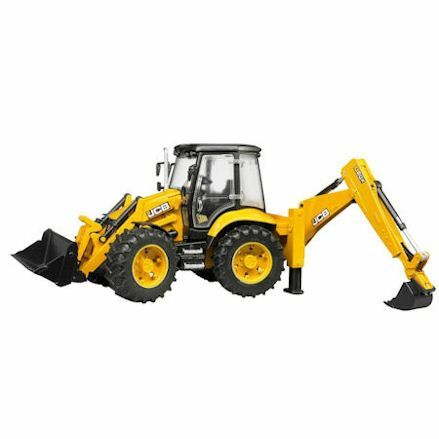 Well each Bruder backhoe model varies in design, they all do the same thing, only the attractiveness and cost is likely to effect customer choice when picking out one of these three toy backhoes - all licensed under the JCB brand. So well they all look similar in design, each have a functioning front loader and pivoting bucket with a rear excavator - or backhoe - that can twist and turn with tipping bucket. Let's take a closer look at all their main features and how each Bruder backhoe, wil lthen compare them side by side. But as you may figure already, each model is pretty much identical in terms of features. Meanwhile you're welcome to view what we consider to be the best toy diggers available to buy in the UK, with a few models unique in design. Misconception of a front loader is it digs; well this is technically true - as it removes the top surface and scrapes away turf - but the clue is in the name. Loader, meaning it will pick up the mud from piles and loads it onto an awaiting truck, or simply moves it to a pile to be taken away later. Backhoes with front loaders are not much different, whether in the back garden scraping the stones, or in a muddy patch digging up dirt, Bruder backhoes can do just that. As standard, Bruder backhoes have links to connect the user control lever to loader arm, similarly, links are also used to pivot the bucket attachment for picking up and dumping. Before you can take away dirt in the front loader bucket attachment, you will first need to dig out the foundation for pipe work, housing foundation or repair work. To do that the driver in the cabin turns the seat so they can control the rear excavator. In Bruder backhoes the rear excavator replicates real life movement and much more; it can twist, turn, go up and down and scoop up and dig out dirt from holes. It works similar to the font loader, links allow the hydraulics (or the child hands) to move the bucket into the ground to dig. In transport mode the excavator is then folded back up behind the cabin for safety. Did you know without stabilizing arms (in child's play or real life) the movement of digging will course the backhoe to tumble over. This is due to the strength required of the front loader or rear excavator to power its way into the ground, resulting in the digger tipping over if it fails. You can always rely on Bruder to come up trumps with all the necessary features, and they've done just that with two pullout stabiliser arms on all their backhoe toys. It works by first pulling out the stabiliser arms all the way, then its a matter of extracting the arms to the reach the ground and in turn, lift the digger off the ground. At this time there are only three Bruder diggers you can buy as a standalone toy, but it doesn't have to end there. 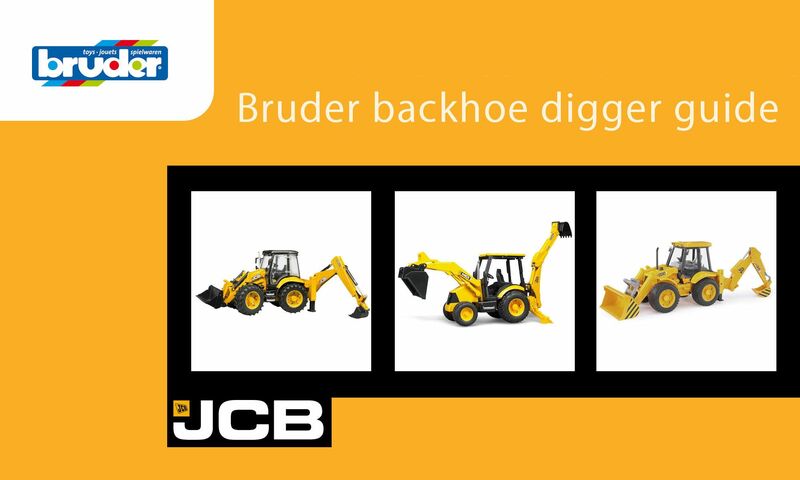 Take a careful look at Bruder's construction series as they have a a couple of JCB backhoes that come with lorries. These are toys focused on lorries with a number of vehicles that come as an add-on, and in this case there are two lorries with backhoes available. Before you commit to a standalone Bruder digger, just be aware your options extend to diggers with trucks - which provides fun with the backhoe, and much more. We've taken all three Bruder backhoe diggers currently available in the series to compare them side by side. To put it lightly, there's little difference between them all, only its obvious that the newer models do feature better functionality, and are more attractive to the eye. First and second addition has unrestricted access to the driver's cabin, well the latest release has an enclosed cab with opening doors. Our comparison chart graphic will compare all available features, and any functionality it doesn't include. 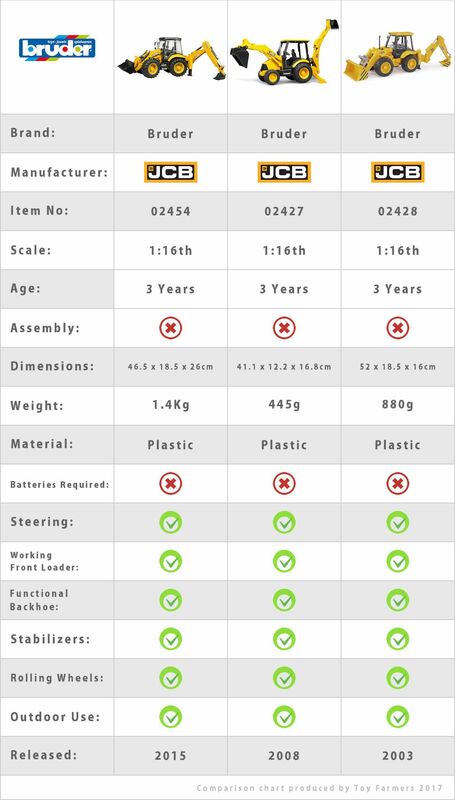 Comparison chart compare all Bruder backhoe models - view full size image. The latest model in the collection, and in our opinion the most stunning of all, this Bruder 5CX Eco Backhoe is built for the biggest jobs on the building site. 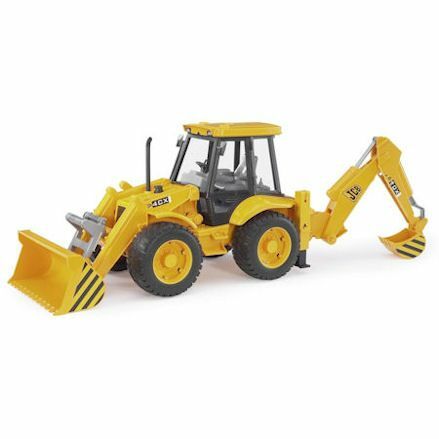 Featuring tinted windows, pull out stabilisers, functioning front loader and working rear backhoe - with replica interior and exterior detail and visible hydraulics. Its all manually done, so well the wheels can be turned by hand, the front loader has an up and down movement with pivoting bucket. Likewise, there's unlimited movement to the rear excavator to assist in digging out holes. Available to buy at: amazon.co.uk, or view more details from our product page. Big favourite with parents and kids alike, this Bruder JCB MIDI CX Backhoe is a smaller then normal digger, but still packs a powerful punch. Big driver's cabin, pull out stabilisers, fully functional front loader with bucket and a rear excavator that goes side to side, up and down and pivoting small bucket for digging. Interesting feature with this model is that rear excavator is detachable, along with the stabiliser arms. Available to buy at: amazon.co.uk or view our official product page for more details. This Bruder JCB 4CX Backhoe is the longest serving digger and the most popular model in the series - well built from durable, hard wearing plastic. 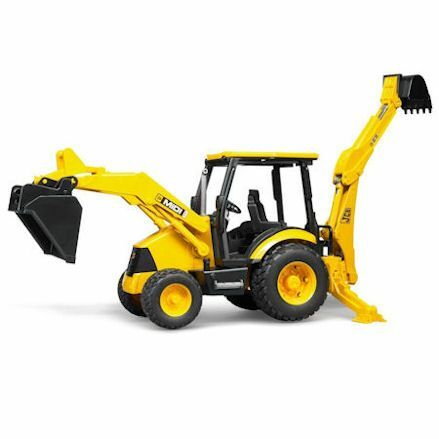 Has a functional front loader with up and down action, tipping bucket with lever, steering wheels, access to the cabin with no windows - and the rear excavator for digging holes. The rear excavator reaches out far and wide, the front loader will need to be lifted up and kept there once the digger is traveling on the road.